Update July 15: The property owner has granted a brief stay to allow Coyote Canyon Caballos d'Anza more time to relocate the herd. The nonprofit group asks public help to contact federal and county elected officials and the Bureau of Land Management to urge that relocation on public lands in San Diego be approved and expedited. Actions that could be taken include the county adding these wild horses to its protected species list and the BLM approving the horses for relocation to the Beauty Mountain area in northeast San Diego County. 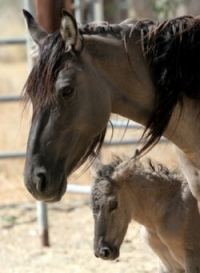 July 14, 2013 (San Diego’s East County) – Plans to restore San Diego’s heritage herd of wild horses to public lands is in peril. An eviction notice has been served on the nonprofit organization that recently found and brought back the last descendants of San Diego’s original wild horses. Unless the property owner backs down, the horses will be evicted on Monday, July 15.